Background: Inter-professional learning (IPL) and inter-professional practice (IPP) are thought to be critical determinants of effective care, improved quality and safety and enhanced provider morale, yet few empirical studies have demonstrated this. Whole-of-system research is even less prevalent. 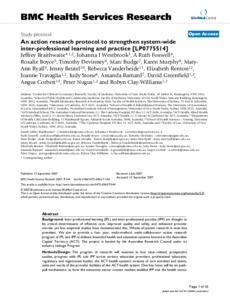 We aim to provide a four year, multi-method, multi-collaborator action research program of IPL and IPP in defined, bounded health and education systems located in the Australian Capital Territory (ACT). The project is funded by the Australian Research Council under its industry Linkage Program. Methods/Design: The program of research will examine in four inter-related, prospective studies, progress with IPL and IPP across tertiary education providers, professional education, regulatory and registration bodies, the ACT health system's streams of care activities and teams, units and wards of the provider facilities of the ACT health system. One key focus will be on pushpull mechanisms, ie, how the education sector creates student-enabled IPP and the health sector demands IPL-oriented practitioners. The studies will examine four research aims and meet 20 research project objectives in a comprehensive evaluation of ongoing progress with IPL and IPP. Discussion: IPP and IPL are said to be cornerstones of health system reforms. We will measure progress across an entire health system and the clinical and professional education systems that feed into it. The value of multi-methods, partnership research and a bi-directional push-pull model of IPL and IPP will be tested. Widespread dissemination of results to practitioners, policymakers, managers and researchers will be a key project goal.